Looking at the results, and I didn’t really know what I was looking at back then, I thought it was pretty good. 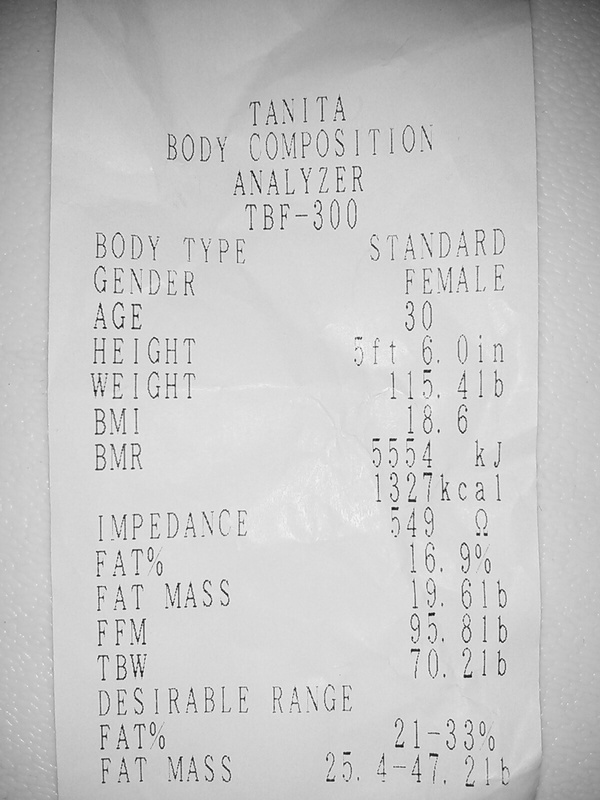 Fat percentage was lower than the desired range but nothing really cause for concern. At this point in my life, though lean, I was completely out of shape and not going to the gym prior to this assessment. 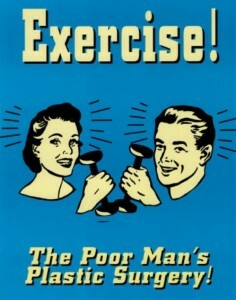 I never exercised, never biked or ran, never did high-intensity dancing, not even lifted a weight. I was usually out of breath when I ran to the bus stop. 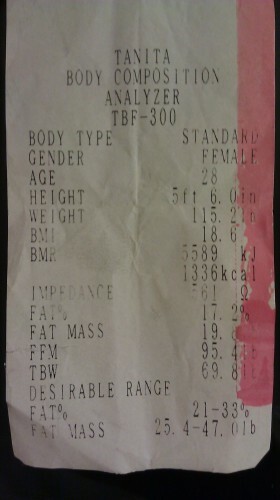 Afterwards, in around first quarter of 2012, I weighed myself again on this scale. This was after I had become a member at Goodlife Fitness and had somewhat regularly started going to the gym for a few months. The results were somewhat alarming to me. 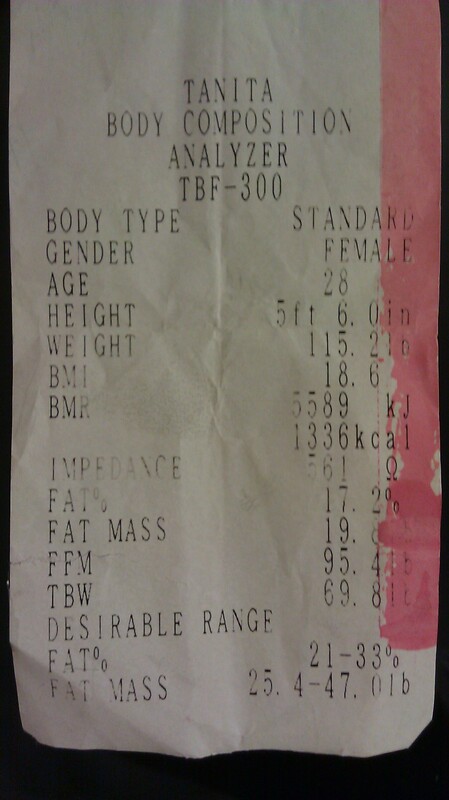 I had accidentally lost about 3 lbs, my fat percentage dropped but so did my fat free body mass (FFM). I didn’t want to lose weight and I wanted to gain muscle so my weight should have gone up and my FFM weight more specifically. I realized that my enjoyment and obsession with all those cardio-centric group exercise classes along with my time on the elipticial machine were likely causing this, alongside my lack of enthusiasm for lifting weights. So from that day forward, I put more of a conscious effort to add weight training to my routine, even bought some weight-lifting gloves because you know, it’s all about accessorizing for the part. I was rather “bleh” about weight-training because firstly, I lack upper-body strength and doing light weights seem like it’s doing nothing and anything more heavy is sometimes a struggle. Plus the day after pain, not cool. Not to mention, it’s not upbeat and fun like a cardio class is, you’re basically doing reps/sets and counting in your head the entire time. I got more motivated in my pursuit for abs of steel and “less weak arms”. I even bought a can of protein powder even though historically, the idea of PROTEIN SHAKES seemed like a joke to me. But now, I thought, if it helps me towards my goals and I can gain more muscle mass with it (or at least help with next day recovery), I’ll try it. Now, in 2013 (holy crap, look at the age progression on these things), I did another try on the scale to see how things have progressed. So at first glance, it looked like the same exact numbers from my first print-out when I NEVER WORKED OUT. What the frak? Pretty much the same overall weight, FFM, fat percentage. What does look different on closer inspection is that the overall weight and the fat free mass is slightly higher, while the fat percentage slightly lower. 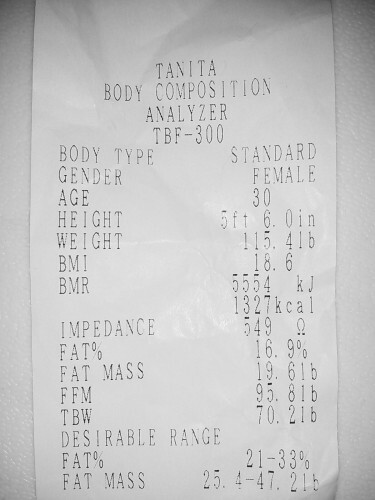 I may be completely pulling this out of thin air, but it looks like what a personal trainer I once talked to told me, which is that when you are working out to build muscle, you’ll gain weight because that weight is muscle. 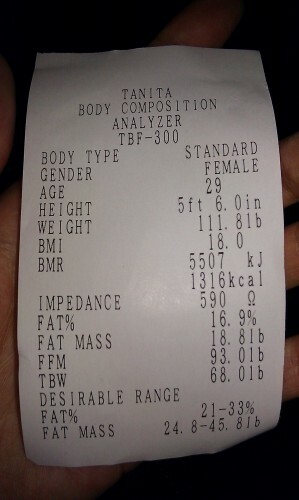 I’d like to keep the fat percentage the same and just keep raising my FFM number and likely, in turn, raise my overall weight. On the surface, it does seem like I am back at square one. But I do feel a bit healthier and at least a bit less stressed than when I was sans exercise. And in my quest for abs of steel? I am definitely not Ms Olympia or anything close but in certain lights, I can see it. So all in all, this fitness journey has been quite a success.